Simple Board Games: Snakes and Ladders. Also known as Chutes and Ladders, Snakes and Ladders is based on an ancient Indian game that was designed to teach morality. The game was initially devised to teach Hindu principles of virtue, represented by the ladders, and evil, represented by snakes. The goal of the game was to reach spiritual nirvana. Squares that were titled faith, generosity, etc bumped the players up the ladders whereas squares such as disobedience, debt, pride, drunkenness, etc ensured the player tumbled down. The Victorian English modified the game somewhat at the end of the 19th century into the more familiar modern day version of Snakes and Ladders. The Victorian values of thrift, penitence and industry, which ultimately led to salvation, were represented on the original Snakes and Ladders game boards. The Snakes and Ladders game board has one hundred numbered squares that begin in the bottom left corner and taper up through 10 rows of 10 squares. The goal is to be the first player to reach square 100. On each row of ten squares are ladders which provide a free ride to levels higher up. Some of the ladders rise quite high, some are somewhat shorter. Also, on each set of 10 squares, apart from the bottom set, is a snake. If a player ends there turn on a snake's head they tumble down the snake's body to the lower levels. It's perhaps no surprise that Snakes and Ladders develops children counting abilities. The interesting thing here is that Snakes and Ladders not only develops counting skills but also basic addition skills. For instance, if a child is on square 9 and receive a dice roll of 5 he/she will move forward 5 spaces to 14. The realization will dawn on the child, or can be prompted by an adult that 9 + 5 = 14. Children also learn the basic sequence and pattern of numbers. They will consistently be rolling fours, five and sixes, and counting the numbers on the board. The game helps children develop social language skills in that bad things can happen suddenly and without warning. For instance, a child may be well ahead in the game, expecting to win easily. The child finishes his/her turn on the head of the longest snake and fall dramatically to last place. This type of reversal of fortune can be a rude shock to a young child and can be a valuable and safe early life lesson. It helps to prepare the child for life's little reversals. An added bonus of course is that in Snakes and Ladders you can still win the game even if you're well behind the leader. This is achieved by vaulting other players when you land on one of the tall ladders and then shimmy to the top. A great way of adding drama and complexity to Snakes and Ladders is to add a dice. Instead of using one dice children are required to combine the added total of two dice. By performing this complex skill within the confines of the game, children have the opportunity to engage in more complex multiplication sequences. A really fun and sometimes challenging addition to the game is for each child to receive two dice and two tokens. This automatically raises the game's complexity and adds a strategic component to the game. Not a bad outcome for oneo fht emore simple board games. The goal for each child is to be the first to guide both tokens from the the bottom square to the top square. When a child rolls two dice, he/she has to make a decision whether to move both tokens or combine the total to move a single token. For instance, a boy rolls two dice for his two tokens. He rolls a 4 and a 2. He visually scans the board and notes that if he moves the two pieces the allocated slots he will fortunately miss the snake's heads, but unfortunately will also miss the ladders. The boy could move both tokens forward safely. However, the boy quickly calculates that if he combines the 4 with the 2 he can move one token 6 spaces. This particular token will finish its turn on a ladder and thus climb up the ladder. The boy makes the strategic decision to combine the two dice for one token to climb the ladder. The other token remains in the same place as at the beginning of the turn becuase it does not move this turn. This simple sequence motivates the child to make decisions and problem solve. 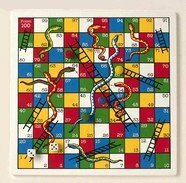 Snakes and Ladders can also be used as a language arts activity. Key place concepts can be incorporated into the fabric of the game while the player is engaged in the mechanics of the game. Concepts such as behind/in front of, up/down, under/over, and time/math concepts such as before/after, first second third, etc can be targeted during the game. As you can see, with even minor tweaks even simple board games like Snakes and Ladders can be an effective learning tool.